Keynote: Finding one’s own space, going to the heart of things. Relates to the feeling-being and may help to calm, centre and support our 'heart-truths'. May assist in finding our own way, coming to new decisions and directions at important crossroads. May be helpful with all issues of space, including respecting space for oneself or another, or becoming more grounded when we are feeling 'spaced-out'. May stimulate a deep link with nature, especially trees. May also help to cleanse and freshen the atmosphere around oneself, among groups and between client sessions. May be of assistance in stimulating awareness for beginner seekers. The Emerald pomander is wonderful for the heart chakra, opening and calming the heart and supportive of any breathwork. In confrontational situations Emerald helps us to bring clarity to the communication of our feelings. It helps us to create the space to find our own way and liberate ourselves of outdated ideas. It soothes feelings of claustrophobia or agrophobia. For therapists and consultants who interact with many others, it helps to more easily preserve a sense of boundary between themselves and clients, and to use between appointments to create space for the next. 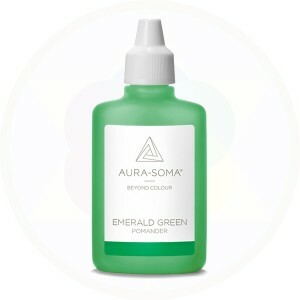 The Emerald Green is a useful antidote for when we feel "spaced out", reconnecting us to the appropriate point in time and space. HOW TO USE: Place 3 drops in the palm of the left hand, rub the hands together and pass them through the aura - front, back and sides - then inhale three times deeply from between the palms. Use as often as desired.